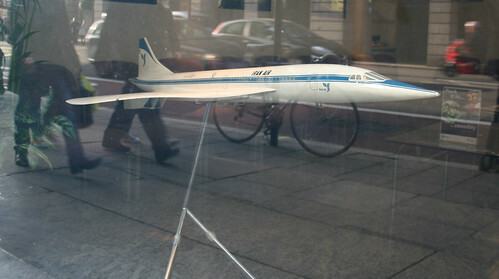 Quite some time ago, I was wandering past the Iran Air travel shop in Picadilly and noticed in their front window was a scale model of a Concorde plane, decorated with the Iran Air branding. Initially, I thought this was a bit of jingoistic hubris by the airline to show how modern they are – understandable as a lot of state owned airlines are more tokens of national pride than viable businesses. However, it didn’t take long on the inevitable Wikipedia to find out that an Iranian Concorde is not just a bit of marketing hype – but came tantalizingly close to actually happening. As the British-French consortium starting pitching Concorde to other airlines, orders for 76 aircraft from 17 airlines were placed – and on 8th October 1972, Iran Air itself placed an order with the British Aircraft Corporation for two Concorde supersonic jets, plus one option. Yes indeed, Iran intended to own a fleet of Concordes. It seems from some reports that the Iranians did this to please the French, who the Iranians had close relations with (and the exiled Ayatollah also lived in France at the time). The first Concorde was due to be delivered to Iran at the end of 1976, with the second in early 1977 and the option for the third would have been delivered in 1978. The two production planes which had been earmarked for Iran Air were A/C 214 and 216, and these were later handed over to British Airways. Amazingly though, Iran Air did actually operate a Concorde plane for a short while, after chartering a plane for occasional flights between Paris and Tehran – so the model inside the showroom is not just hype. There was for a short while, an actual Iran Air Concorde in flight. Incidentally, Singapore Airlines also chartered Concordes for a few flights, as did a US firm, Braniff International Airways. The orders for the Concorde planes were canceled in April 1980, in the wake of the Iranian Revolution, also making Iran Air the last airline to cancel its Concorde orders. Quite possibly one of those “what if” moments. If oil rich Iran had retained their orders, and helped production limp along for another couple of years through the worldwide recession, could the other airlines have come back to complete their purchases when their economies recovered? Who knows. I can’t blame Iran for canceling their orders, as like most airlines at the time, Iran Air was more a symbol of national identity, and the Concorde’s were most certainly toys for the Shah rather than aircraft for his people. Still, it’s a pity nonetherless. It was ironic that I noticed the Air India in the options list, as India banned Concorde from flying supersonic over its airspace, and that restriction is what killed off the Singapore Airlines lease deal. 2 Pings/Trackbacks for "The Iranian Concorde"